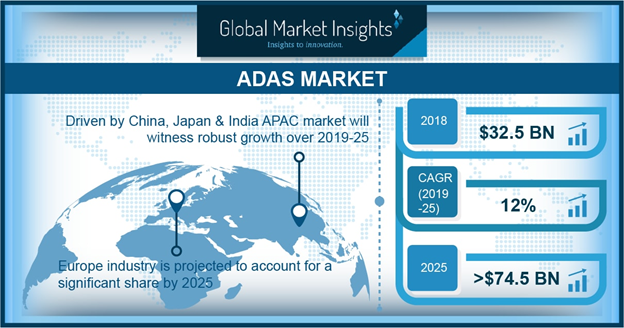 Advanced Driver Assistance Systems (ADAS) Market size is estimated to exceed USD 67 billion by 2024; according to a new research report by Global Market Insights, Inc. The ADAS Market is driven by reduced visibility at night and steep turns, growing mobile phones usage during driving, user misjudgment due user fatigue results in significant loss of human life and property damages. According to global status report on road safety by World Health Organization (WHO), around 1.3 million people are faced with fatal accidents, accounting for the world’s third largest contributor to human fatalities. This in turn is expected to drive the urgency for deployment of advanced driver assistance systems through the forecast timeframe. Stringent government regulations pertaining to vehicle safety, including the mandatory fitment of safety technologies including AEB and parking sensors will further support in ADAS Market expansion till 2024. For instance, according to NHTSA-IIHS announcement, twenty vehicle manufacturers have pledged to introduce low speed AEB systems in their passenger vehicles. These companies represent over 99% of the nation’s automotive industry. Increasing consumer inclination towards vehicles featuring advanced driving assistance system integration will fuel the advanced driver assistance systems (ADAS) market growth. Some of the leading automotive OEMs have initiated providing built-in systems or collaborating with the technology providers to maintain their strong industry foothold. For instance, in April 2017, Nissan partnered with BMW AG and Volkswagen AG for using chips and sensors developed by Mobileye. These are utilized for mapping and autonomous driving and will help the company in strengthening its automotive sales. This will provide solid growth platform for the proliferation of the overall ADAS market share. Features that include intelligent park assist system, blind spot detection, image sensors and surround view have significantly contributed towards ADAS market growth. Moreover, driver assistance for complex and repetitive tasks to reduce human errors under complex situations will further expand the market share. However, operational complexity of these technologies in conjunction with and high cost of the systems and user awareness are expected to hamper the overall industry growth. LiDAR sensors acquired over 20% of the ADAS revenue market share in 2017, will witness 12.5% CAGR over the forecast timeframe. High accuracy, fast processing, minimum human dependence, weather independence, competitive sensors costs are among key properties driving the LiDAR demand. Effective prevention from geometrical distortions including angular landscape will provide positive outlook for LiDAR segment in ADAS market size. Based on distribution channel, aftermarket is expected to witness highest CAGR through the forecast period. This can be credited to the provision of cost-effective automotive components driving the aftermarket industry growth. Easy product availability due to abundant component suppliers operating in aftermarket will drive the industry growth. Moreover, higher replacement rates of the electronic sensors and related components will present strong growth potential landscape for the ADAS aftermarket. Industry participants are engaged in providing technologically advanced products and emphasizing on improving the system detection and operational capabilities for providing the accurate information to assist the driver. For instance, in October 2017, Denso Corporation introduced Automotive Head-up Display system to project critical driving information onto the windshield for the drivers.